Touch a document, create a punch. With SKYSITE’s punch list management software, punches and documents are side-by-side. 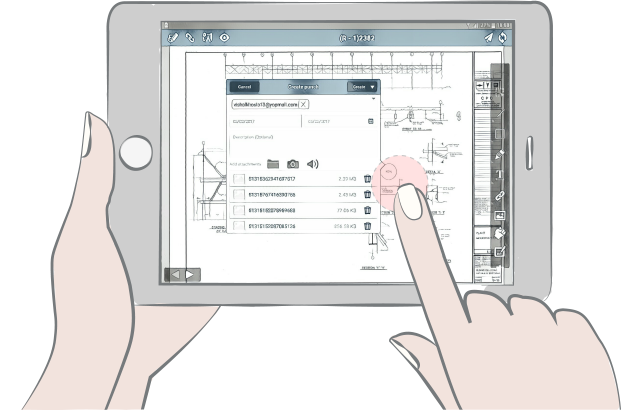 You can connect a task on the punch list with a drawing, add a photo, connect it with a video or even a voice memo. No running back to the job trailer or hauling out the laptop, either — if you’ve got a smartphone, you can run the punch list app. Build a task or issue from your favorite mobile devices with our app for iPhone and Android. Make punchlist reports for better tracking and scheduling. Give a task to the right person with the right skills. Add custom fields to a task for extra information that helps you find it when you need it. It’s easy to use this best punch list app for QA/QC tasks, too. Quickly navigate your punch reports with an index that is auto-hyperlinked to the task details. You don’t need one more app. Handle punchlists in SKYSITE with the rest of your documents.